Regular exercise is an important component of helping you lose weight, get into shape and maintain your results. Do something about those unwanted pounds by making healthier food choices and adding physical activity into your daily routine. The most effective weight-loss plans focus on burning more calories than you consume by reducing your unhealthy food intake and increasing your involvement in exercises such as running. Irrespective of whether you have a history of running or are just starting out, you can get in shape by gradually changing your unhealthy lifestyle habits. Visit your physician for a routine health exam. If you are out of shape, do not jump into any exercise or diet without first consulting your physician for recommendations. You may need to modify your weight-loss plan based on your health status. Lose weight safely and effectively by reducing your intake of food calories by 250 to 500 per day, which can lead to 1 pound of weight shed per week. A calorie deficit is key for weight loss. Optimize your calorie reduction by also burning 250 to 500 calories a day. Lose 1 to 2 pounds per week by combining exercise and a lower-calorie diet to create a total daily deficit of 500 to 1,000 calories. Swap the junk-food snacks, high-fat foods, sodas and big-meal portions for fresh fruits, vegetables and whole grains, lean protein, water and smaller meals. Produce consists of naturally low-calorie foods you can munch on between meals instead of chips, cakes and candy. Eat an array of colorful veggies and fruits for lunch, and add steamed veggies as a meal side. Opt for leaner proteins like grilled fish or baked skinless chicken instead of fatty steaks, fried meat or ham. Drink water throughout the day to quench your thirst and prevent hunger from leading you toward fatty snacks. Halve your meal portions to help cut calorie intake. Start walking three to five times a week in segments of 10 to 20 consecutive minutes for two weeks. If you can walk for 10 full minutes without stopping, then continue your walk for another 10 minutes. By the end of two weeks, you should be able to walk for 20 full minutes. Keep a moderate pace, pumping your arms slowly and breathing normally. Pick up your pace each day you walk to increase your calorie burn and build stamina. Alternate walking with running on the third week for 30 minutes. Walk for five minutes then run for two minutes until you complete 30 minutes of activity. If you can run longer, then do so but do not overdo it. Gradually increase your run time as your body adjusts to the new activity. Add more run time each week and slowly decrease your walking time until you are running for a full 30 minutes. Increase your run time weekly as you become more comfortable with running. 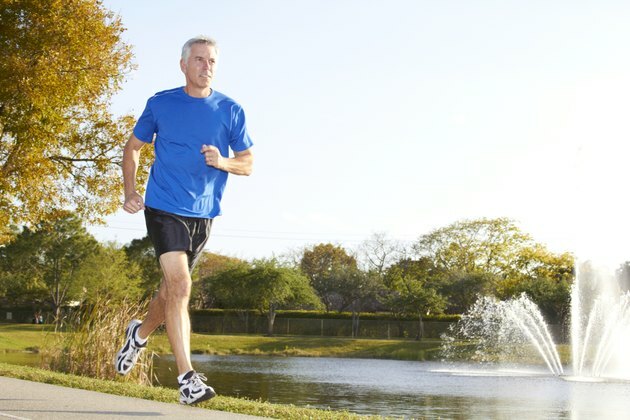 Set a goal to run longer per workout each week until you are no longer walking. It may take several weeks before you are running the entire workout. Healthy nourishment from small meals and snacks helps you stay energized throughout the day. Warm up and stretch before each workout to prepare your muscles for intense movement. Cool down after your workouts to get your heart rate back to normal range. Do not focus on the distance you run; instead try to work out for the duration of time you intended. Drink water before, during and after workouts to maintain hydration. Eat a light snack an hour before your workout to sustain energy. Stop running if you feel pain, and if it persists, seek medical attention.